The Sun symbolizes our ego and leadership in astrology. So when it occupies the 1st house all eyes are on you. You project a strong presence and your personality really shines. But with all this attention you can also feel very self-conscious and get upset or nervous quite easily. The personality traits associated with the Sun include being direct and going for what you want. The Sun helps you wade through all the extraneous matters in life to figure out what drives you. 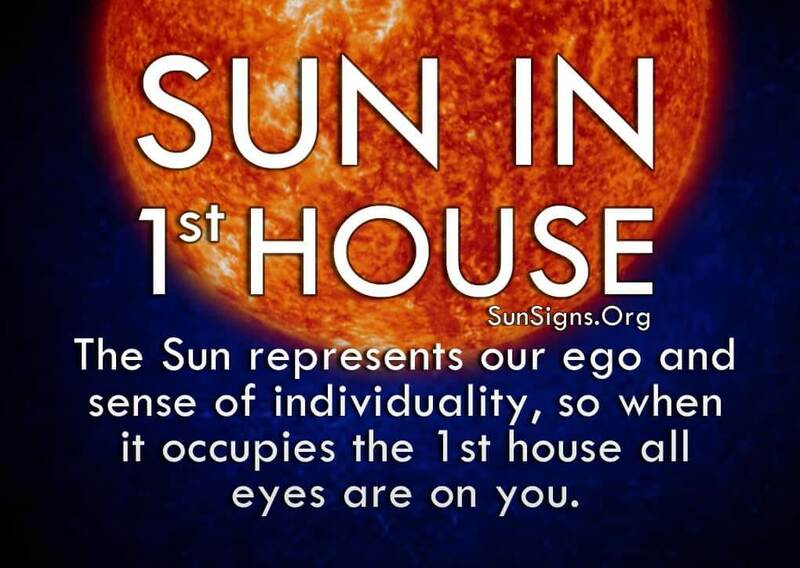 So when the Sun is in the 1st house you feel more confident, as if you could conquer the world. The enthusiasm of people with Sun in the first house is unmatched, and your determination is unbreakable. You are ready to take the lead and make things happen. This is a very active time period and you should take advantage of every impulse you have to get things done. At this time, there is no one more qualified to make yourself happy than you, so listen when your inner voice has a good idea. Take pride in your ideas and efforts, so long as they remain healthy and productive. If there are things in your life that you are unhappy with, now is the time to take care of them. With the Sun in the 1st house in your birth chart, you turn everything inward to decide what you really want out of life. And you have the energy to make it come true. This is a good time to do some self-reflection and evaluate where you are in your life. Look at your personal dreams and goals to see if you’ve truly fulfilled your wishes. If not, figure out what’s most important to you and create a list of priorities to make it a reality. If the Sun is in the 1st house in your horoscope, you are willing and able to set things in motion as long as you maintain your focus. It’s easy to get caught up in the excitement and commotion you create by moving forward, so much so that you may forget your original goal. Don’t make things any more complicated than they need to be. Simply figure out the best path to reach your goal and stay on that life path. This means you should not concern yourself with what others think of you. Because people who are born with the Sun in the 1st house are so concerned with what matters to you, you are also aware of how others perceive you. This can be a good thing or a bad thing, depending on how you react to it. If other people are positive about what you are doing, it’s easy to be positive as well. But if someone offers you a negative response, it’s also easy to become depressed or despondent because you were so excited about it to begin with. As long as you are not affecting yourself or anyone else in a harmful manner, keep going with your plans. There will always be those people who have something negative to say, and it’s up to you to decide whether or not to listen to them. It’s one thing if they are concerned for your well-being, but it’s another if they just don’t agree with your ideas. The only thing you have to worry about is going too far. Don’t push your ideas on anyone else or be too boastful about your current business plans. Allow people to be happy for you.